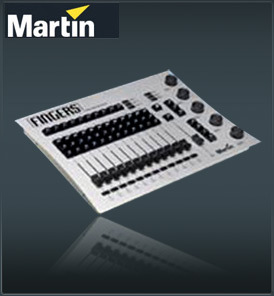 Designed as a hardware interface to make Martin’s popular LightJockey software even more intuitive and accessible, Fingers allows the PC to keep pace with your imagination. Martin Fingers is a new, robust, front end, dedicated to the well-known Martin LightJockey – a Windows (PC/Laptop) based, lighting controller that lets you interface either 512 - 2048 channels and is capable of controlling up to 100 DMX fixtures. Supporting a highly customizable setup, Fingers permits a large number of the LightJockey functions to be mapped directly to physical faders, buttons and jog wheels. This gives the user an easy, hands on live-show and play-back control.